Vanilla, artificially flavored. 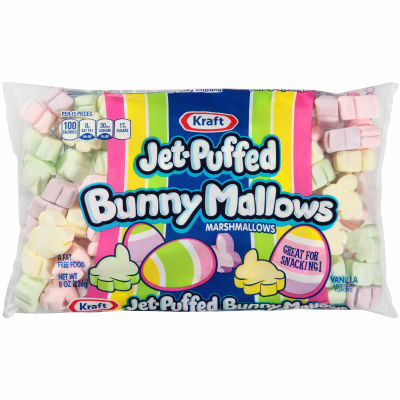 BunnyMallows Fun Uses: Use to decorate your favorite pudding pie. Sprinkle over ice cream or Jell-O Pudding. Decorate frosted cupcakes that have been sprinkled with green-tinted Baker's Angel Flake Coconut. Thread onto swizzle sticks for a fun Spring drink garnish. Add to hot cocoa. Dip in Baker's Dipping Chocolate for an indulgent treat. Caution: Marshmallows and/or chocolate may be hot. Handle with care. Serving size 15 pieces (30g).